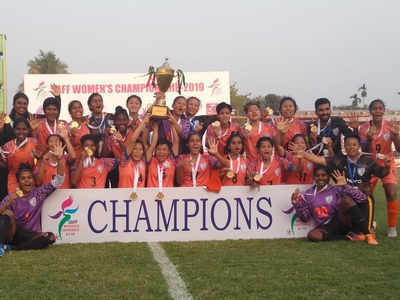 •	In football, India has clinched the SAFF Women`s Championship for the fifth time in a row, defeating hosts Nepal 3-1 in the final at Biratnagar. •	In the first half, Dalmia Chhibber of India scored the first goal of the match which was equalled by Nepal`s Sabitra Bhandari at the 33rd minute. •	In the second half, Grace Dengmei scored the second goal at 63rd minute and Anju Tamang scored third and decisive goal in the 76th minute. This was India`s 23rd straight victory in the championship since its inception in 2010. •	The SAFF Women`s Championship, also called the South Asian Football Federation Women`s Cup, is the main association football competition of the women`s national football teams governed by the South Asian Football Federation(SAFF). Seven members currently compete in the tournament. Formerly, eight members competed, before the departure of Afghanistan from SAFF. •	The current SAFF members are Bangladesh, Bhutan, India, Maldives, Nepal, Pakistan and Sri Lanka. It is held every two years. •	So far India has won every edition, beating Nepal three times and Bangladesh once in the final. •	Superstats, a new metrics to analyse the game of cricket, has been launched by ESPNcricinfo in partnership with Indian Institute of Technology Madras. •	Superstats is a combination of stats metrics – Luck Index, Forecaster and Smart Stats that uses Data Science for the first time to give a context to every event in a game and also venture into new territories such as luck and forecasting. •	These metrics have been derived from ESPNcricinfo’s rich ball-by-ball database, and from complex algorithms developed by IIT Madras and Gyan Data, an IIT-M incubated company. •	In the era of multiple formats and leagues, game of cricket needs to move beyond conventional measurement system such as economy rate, average and strike rate. The development of these new metrics filled a long-felt gap in evaluating cricket performances.